Solar heating costs up to 55% less than using gas or gasoil for heating. We, at Soliclima, have designed an integral solution to reduce a great number of costs. With the use of the best equipment and the best technology in heating, we have achieved efficient and long lasting installations. If we want to get the best profit of solar energy posibilities, we can use our solar hot water system for our domestic heating as well. Needed devices are just the same, althought the size of them can vary. It is also necesary to have more solar panels. Working system is also similar, allthough solar domestic heating covers less energy consum than in the solar hot water case. The way of doing this is so because is the most rentable for the user. You will need, then, an auxiliar heating system. Most appropriate heating emissor is radiant floor. Among other advantages, it only needs ist hydraulic circuit up to 40ºC, while other heating emissor as radiators need its hydarulic circuit up to 70ºC, so you need much more fuel for your heating system. • High quality levels of Soliclima installation, which ensures its long life and durability. Soliclima has a Technical Support team all around the States. Hundreds of satisfied clients endorse us. Solar panels facilities in Los Angeles, California. In this ocasion, we can see a solar hot water facility for a 200 m2 single family residence, for a family of 4 people. In this case, problem was to integrate panels and try not to break the look of urbanization, so we opted to install them on the roof. 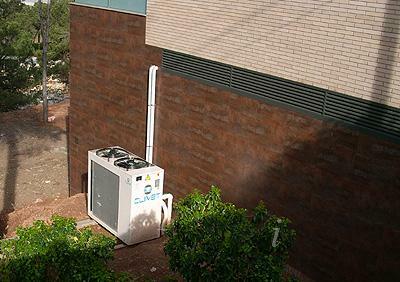 Hot water generated by solar panels is stored in a 300 liters tank. There are two main types of solar energy. Solar thermal energy, that heats drinking water and can be also used for domestic heating, althought in that case, it doesn't cover 100% of annual demand, and it is necessary to complete it with an auxiliar system,for instance a boiler. The other solar energy is photovoltaic, although this one not usually used in domestic energy production. This is the case only in case of rural dwellings without grid electricity. Its use is more directed to the sale of electricity to electrical company. Some american companies offer different subsidies for this cases. There are also other usages of solar energy, less used, as thermoelectric, that consists on generating electricity with solar heat. There are only some few commercial plants in all the world. California has several of this plants, but most of them are yet experimental. we can also find solar cookers. There are a lot of different models. Most of them are only used in developing countries, where energy supply is a problem. But in many people in occident is more a more interested in this solutions. Some of the models can be installed as main energy source at your kitchen home, if you live in a sunny state as Texas, for example. In India, there is a temple that offers 18.000 daily mails to the visitors of a temple. There is something important to say about the name of the panels. When we say panel, we are referring to any kind of solar panel. When we say collector, we are referring only to solar thermal panels. And when we say modules, we refer to photovolaic panels.